The list has been narrowed. It appears to be a foregone conclusion that FIFA World Cup matches will be played on Canadian soil in 2026. The United Bid of Canada, USA, and Mexico is the heavy favourite to land the global spectacle. Morocco, which could have trouble hosting the new expanded 48-team format, is the only other country to have declared its intention to bid. Sixty of the 80 matches are expected to be held in the United States, with Canada and Mexico getting 10 each. The North American bid announced on Thursday that 41 cities have made their official declaration of interest to be part of the final bid that will be sent to FIFA by March 16 next year. Of that list of cities, six are from Canada, including: Edmonton, Montreal, Ottawa, Regina, Toronto, and Vancouver. Calgary, which was previously identified as a potential host city, is no longer in the running. Toronto and Montreal had stadiums to choose from, and went in different directions. The larger/older Olympic Stadium was chosen in favour of the home of the Montreal Impact, Saputo Stadium. Toronto elected to go with the smaller/newer BMO Field, home to Toronto FC and the Toronto Argonauts, instead of Rogers Centre. Vancouver’s BC Place would appear to be the strongest favourite of the group, given the size and modernness of the stadium. Vancouver also successfully hosted the FIFA Women’s World Cup Final in 2015. The rest of the stadiums have pros and cons. Montreal and Edmonton boast the two largest stadiums, although both Olympic Stadium and Commonwealth Stadium are dated. BMO Field, TD Place Stadium, and Mosaic Stadium are smaller stadiums with the ability to expand their capacity to 40,000 with temporary seating. 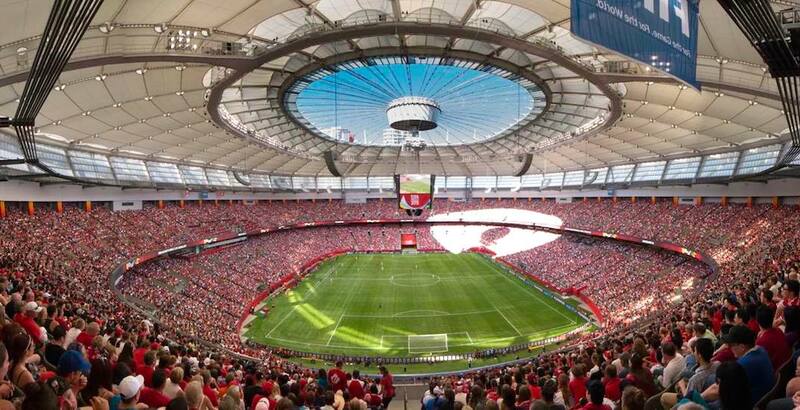 A capacity of at least 80,000 – larger than any stadium found in Canada – is required for the opening match and final. Semi-final matches require a 60,000-seat capacity, while all other matches must have at least 40,000 seats. Toronto should have an edge given that it’s Canada’s largest city, but BMO Field in its current state is not designed for large events. BMO’s playing surface has an edge though, as the only stadium listed with natural grass. Natural grass will need to be installed in every stadium chosen to host matches. Most matches will be played in the United States, of which 35 stadiums are in the running. Just three cities in Mexico are in the running, with Mexico City’s Estadio Azteca the heavy favourite. The United Bid Committee will review all submissions and release a shortlist of cities later this fall. About 20-25 cities will be included in the final bid to FIFA, with at least 12 cities ultimately serving as official host cities. Expect about 2-3 to be from Canada. The submitted bids provide information about each city’s experience hosting major sporting and cultural events, potential venues, transportation infrastructure, available accommodations, and environmental protection initiatives. In addition to providing a suitable stadium, each city must provide top international-level training sites and locations for team base camps.